The Painted Buffalo Inn is located just three blocks from historic downtown Jackson Hole. Within walking distance, the rustic western charm of town square hosts a variety of wonderful restaurants and eateries, quaint shops and boutiques, enchanting art galleries, stimulating museums, and exciting nightlife. At the Painted Buffalo Inn our accommodations provide you with Old West hospitality and modern-day amenities. Shuttle stop on site, pet friendly, free parking, and a swimming pool are just a few of the conveniences we offer our guests. Our rooms are comfortable and clean and will provide you with a relaxing place to rest your head at the end of an adventurous day. 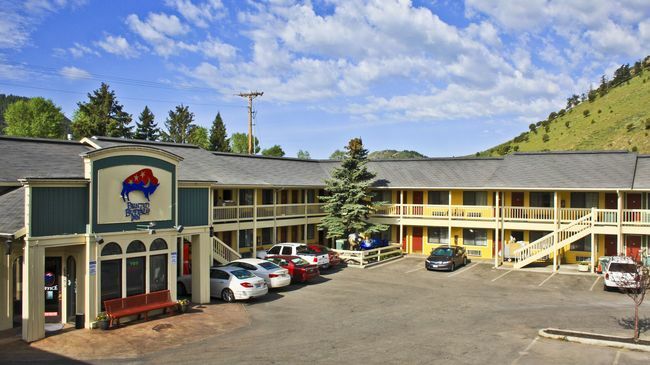 Within walking distance of this Jackson Hole, Wyoming Lodging property, the rustic western character of the Town Square hosts a variety of restaurants, eateries, quaint shops, boutiques, art galleries, an exciting nightlife, and the famous Jackson Hole Shootout. Many of our visitors also come to see the vast amount of wildlife that make our little valley home, whether it be a bear, moose, elk, pronghorn, buffalo, fox, mule deer and even the occasional jackalope. After experiencing the Painted Buffalo Difference, many of our guests have seen exactly what makes us one of the premier Jackson, Wyoming hotels.